Rouzerville THEN . . .
Confederate troops invaded the North on their march to Gettysburg. As they retreated on July 4, 1863, they passed through Rouzerville. In the early morning hours of that day, Union troops engaged them in a battle that never earned a name in the history books. That “Battle of Rouzerville” (then known as Pikesville) is the only Civil War battle to have the distinction of being fought on both sides of the Mason-Dixon Line. Franklin County, and Rouzerville, were overrun many times by the Confederates, and suffered losses of life and property damage in the millions. 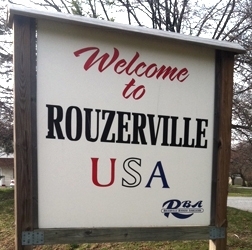 Rouzerville is experiencing another invasion — a kinder, gentler one — that is proving to be an economic boom for the entire area. Rouzerville Commons is thriving and there is the recently opened Applebee’s and a new Sheetz store. Construction is completed on a new Susquehanna Bank. The Commons includes several other stores and a Chinese Buffet. Other businesses, such as Rolling Mill Tavern, are helping to make Rouzerville the shopping and dining hub of the area. There has been an influx of shoppers, workers, and home buyers. 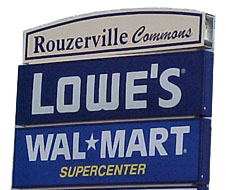 Anchored by Wal-Mart and Lowes, the new complex is also drawing customers to existing businesses. The RBA is here to serve all businesses, and the community that is growing up around them, through fund-raising events in support of area charities and families in need.